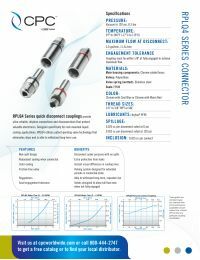 Colder RPLQ4 Series Quick Disconnect Couplings are reliable, dripless connectors designed for use in rack-mounted liquid cooling applications. The non-spill design and durable construction of the RPLQ4 series ensures that the connectors continue to protect valuable electronics over time. Couplings need only be within 1/8" of fully engaged in order to achieve the maximum flow. These RPLQ4 connectors are constructed out of chrome-plated brass with polysulfone valves, and come with either cool blue or warm red color rings for quick identification.